INCIDENT ADDRESS: 1313 N. Ruby St. NARRATIVE: At 0630 this morning, Saturday August 2, 2008, the Spokane Fire Department responded to a reported fire in Sonic restaurant at 1313 N. Ruby. The first crews on scene reported a fire behind the fryer unit in the kitchen. The fire was quickly knocked down, and there was no fire extension to the structure. Damage was confined to the fryer unit, with minor smoke damage throughout the restaurant. Health officials were notified of the situation and are expected to conduct an inspection of the restaurant prior to the business resuming operation. PROBABLE CAUSE: The cause of the fire was the fryer unit. Fire investigators have yet to determine whether the unit malfunctioned or whether there may have been maintenance problems. DAMAGE EXTENT: Damage to the structure and contents is estimated to be $12,000. NARRATIVE: On Thursday July 31, 2008 at 11:10 AM (during the 722 Altamont Fire), six companies of Spokane Firefighters, 4 Engines and 2 Senior Ladders under the direction of Battalion Chief Hanna responded to a reported building fire at the Applied Sciences Building 502 East Cataldo on the Gonzaga Campus. When Ladder 2 and Chief Hanna arrived, they were met by security and reported a 3-story commercial building with confirmed smoke in the basement. Companies were utilized to search and simultaneously evacuate the building while others located and extinguished the fire. The incident was placed under control in less than 30-minutes and no firefighters or civilians were injured during the event. PROBABLE CAUSE: The origin of the fire was in basement mechanical room and cause was a electrical. DAMAGE EXTENT: Damage was limited to the mechanical room and minor smoke odor/damage in the basement. 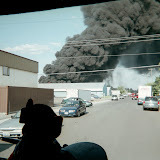 NARRATIVE: On Thursday July 31, 2008 at 9:55 AM, 6 Companies of Spokane Firefighters, 4 Engines, 1 Heavy Rescue, and 1-Senior Ladder under the direction of Battalion Chiefs Ken Kirsch and Joel Fielder responded to a reported Apartment Fire at 722 South Altamont. When the first company arrived, they reported heavy smoke and fire showing from the second floor of a multiple family, two-story townhome. Neighbors and Police nearby also told arriving firefighters that there were children missing. The Ladder company was immediately used to ventilate the roof and search for the missing children while Engine companies attempted to extinguish the fire from the second floor. Due to the fire's conditions and construction type, the alarm was also upgraded to a working fire which added an additional Engine, Senior Ladder and Pumper-Ladder. It took 33 Firefighters 45 minutes to locate and knock down the fire and control the incident. Firefighters were able to limit the damage to the second floor and attic areas of the building. All children were accounted for and were removed prior to the SFD's arrival by neighbors. A young child received moderate burn injuries from the fire and received treatment by SFD Paramedics, however refused transport by AMR. The child was reportedly transported by relatives to the hospital at the time of this release. No firefighters were injured as a result of the incident. PROBABLE CAUSE: The origin of the fire was on the second floor balcony. The cause was an unsupervised 4-year old child playing with matches. DAMAGE EXTENT: Damage is significant throughout the second floor. Structural integrity of the roof members and associated lightweight wood-frame structural members is in question. Re-occupancy is not possible without considerable clean up and construction.